Whether you have a two-mile race coming up or want to drop your two-mile time on a solo run, you can get faster with some speed training. Speed workouts improve your lung capacity and help your body adjust to running faster even when you are tired, simulating race conditions. Before you begin doing speed work, you should have a solid running base of regular running for at least a month under your belt, advises the Runner's Resource. Incorporate interval training into your workouts at least once a week. Intervals are short, intense bursts of speed alternating with periods of recovery. For the two-mile race, do four to six 400-meter intervals at your ideal race pace. Between each interval, jog or walk 400 meters to recover. Do a tempo run once a week. A tempo run involves running at a faster pace than your regular training runs for the entire workout. If you normally run two miles a day at 10-minute mile pace, for instance, try doing a tempo run by going two miles at 9:30-minute mile pace. Build your running base by doing regular training runs most days of the week. Make at least one of your base runs longer than two miles each week, to build your endurance. Do base runs at a relaxed, easy pace that you can hold a conversation at. Record your running times and distances after each workout to track your progress. After a few weeks of speed workouts, you should start noticing a drop in your run times. Do not get upset if your times fluctuate some, because everyone has off days, and conditions such as the weather, time of day and terrain can also affect your performance. Check your progress in the two-mile run by competing in a two-mile race or doing a two-mile time trial. 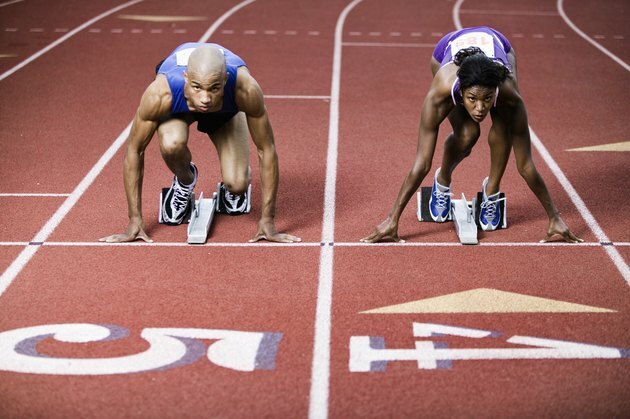 You can race against the clock on your own on a track, or enter a race for fellowship and competition. Warm up before doing speed workouts by running for five minutes at a slow pace, and cool down by doing the same. Listening to music can help you run faster. Create a running mix to listen to when you do speed workouts to get yourself pumped up. If you experience any sharp or lasting pains while running, stop immediately and call your doctor. Allow yourself time to rest by spreading out your races over a matter of weeks or months, and take off one day a week to rest. If you overwork your body and do not rest, you will be more likely to get injured and burned out on running. Can You Train for a Beep Test on a Treadmill?